Great for a couple, family or individual that wants to go camping without the hassle of putting up a tent, cooking, and cleaning. 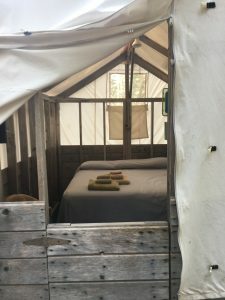 These spacious tents have two twin beds or a single king bed. All tent cabins are fully furnished and share communal showers, sink, and toilets. *All stays include breakfast, dinner, and trail lunch. See restaurant for further details. These single room cabins are perfect for one – three adults or a family with a small child. These cabins are fully furnished with one queen and one twin bed. They also include a single shower and toilet. This is the cabin for any family or friends that want to spend quality time outdoors having fun and not setting up an entire campsite. Both family cabins are fully furnished and have showers and toilets. Family Cabin 5 and 6 have a queen bed in one room and in the adjacent room, one bunk bed and a twin bed. Family Cabins 9 and 10 have a queen bed in one room and two twins in the second room.